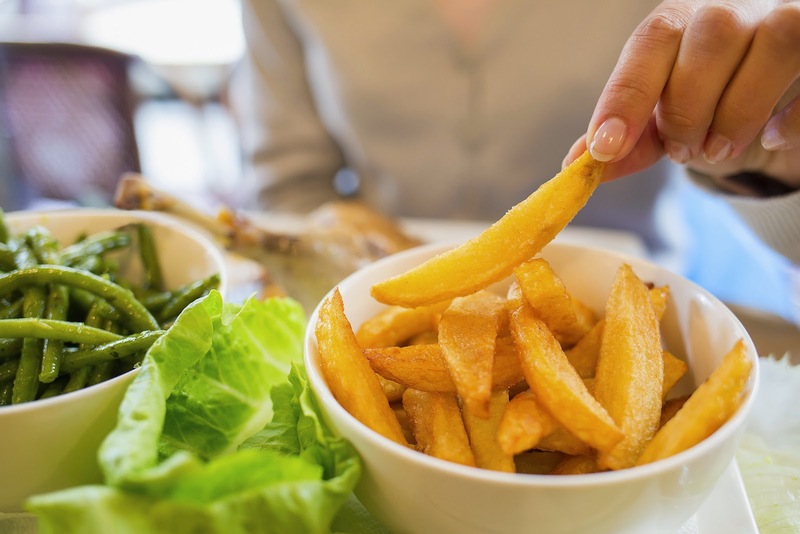 One type of food you should avoid at all costs is foods containing trans fats, since they can increase the risk for heart disease or stroke," says Tamara Melton, a registered dietitian nutritionist and an Academy of Nutrition and Dietetics spokesperson. Trans fats are used to improve taste and texture in processed or fried foods, so they can be hiding in many things we eat. Even if you check labels, you could still be eating foods with trans fats without even knowing it. Common foods that contain trans fats include salad dressings, frozen pies, and cake frosting, so be sure to limit your consumption of these processed foods. In general, you can't go wrong by just avoiding processed foods altogether. It's not just trans fats you have to worry about: foods made with any type of refined sweeteners like high-fructose corn syrup can contain more than a day's worth of added sugar to your day, which is harmful to your health for more than a few reasons. "It ages the skin and causes joints to stiffen," says Simone Gloger, a registered dietitian and head nutritionist for the Dukan Diet. Not only that, but opting for something processed means that you're missing out on the nutrients you need to feel and look your best. Limiting these foods can be hard when you're running around town and starving enough to grab the first snack you see at the convenience store. That's why preparation is key. "I always carry healthy snacks with me throughout the day to avoid getting in a scenario when I am hungry and have to resort to junk food or processed food items," says nutritionist Kathie Dolgin, author of Sugar Savvy Solution. Allison Enke, a Whole Foods registered dietitian, goes even further. "One food I avoid eating is movie theater popcorn: depending on the size and toppings, [it] can contain anywhere from 500 to 1,500 calories and be a significant source of fat and sodium," Allison explains. "If I want to snack at the movie theater, I usually smuggle in a healthy, portion-controlled one like a baggie of trail mix or fresh fruit." When it comes to trans fats, always read labels and limit the fried foods you order at restaurants and fast-food chains, since many use trans fats to deep-fry.